When creating an assessment unit, we are designing backwards and planning with the end in mind. - Wiggins & McTighe (1998). As you look at the flowchart (click to open larger), notice first that the flow is not in one direction. There is a sequence indicated by the order of the boxes from the top to the bottom of the page. However, all of the elements represented in the boxes are related. This means that you need to constantly check back and forth among these elements to make sure that everything is in sync. For example, when you begin identifyingcan-do statements and related grammatical structures, you may realize that your unit goals do not require using those functions. You, therefore, have to make a decision to adjust the unit goals or to adjust the grammatical structures or both. Let’s begin at the top of the flowchart with the Standards. These are the World-Readiness Standards for Learning Languages (2015) which incorporate the Standards for Foreign Language Learning: Preparing for the 21st Century (1996) and Standards for Foreign Language Learning in the 21st Century (2006). States and school districts may have developed their own state and local standards. Generally, these documents reflect the overarching goals of the World-Readiness Standards. The Standards tell us in broad terms what should be taught in world language classrooms. 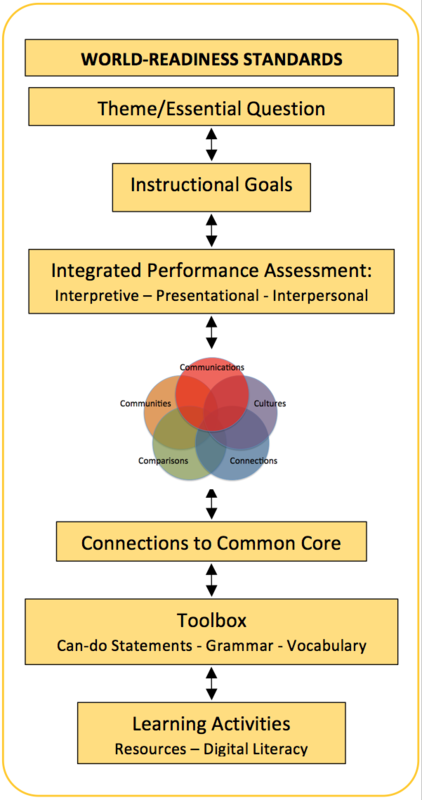 A well-constructed integrated performance assessment unit will incorporate all of the Five Cs of the World-Readiness Standards. The Standards are the foundation that influences all other decisions about planning a unit of instruction. They should be a constant point of reference as you plan your assessment unit. With the Standards as a mindset, you can now select a theme. The theme has to reflect important learning—the theme has to be worth studying. It should address a “big idea” that has enduring value beyond the classroom (Wiggins & McTighe, 1998). For example, many world language students learn about clothing. Using "clothing" as the thematic center is not particularly intriguing: it is not a big idea. Instead of provoking communication, it signals a list of vocabulary words. Think beyond a vocabulary theme to an essential question: do you form opinions about people based on what they wear? Is what you wear a reflection of your personality? Do you stereotype people by their clothing styles? Would your characterizations of people based on what they wear be valid in another culture? A "big idea" might be responding to the question: "Does clothing tell a story?" You have now changed a vocabulary-based theme into an intriguing question to engage your students in meaningful communication. Exploring possible answers to the question connects the learning to the real world. After selecting the theme and essential question, you need to articulate why you are teaching this theme. What are your instructional goals for this unit? You might think that the Standards are why you are teaching a particular theme. This is correct, but remember that the Standards are broad statements. Instructional goals are specific to the particular unit you are planning. What do you want the students to know and be able to do at the end of the unit? When determining these instructional goals, it is best to begin by brainstorming all the possible ideas related to the theme. Next organize the ideas as they relate to the 5 Cs Finally, prioritize what is most important, what is most interesting, what helps respond to the theme. You should narrow your focus to four to six goals that are interrelated, that reflect increased communication, greater cultural insights, and an understanding of the theme. When you have your instructional goals in place, you need to ask yourself: How will you know that the students have achieved the goals? This is your integrated performance assessment, which is really at the heart of your unit. The integrated performance assessment is the application of learning to a real-life situation. The integrated performance assessment includes the three modes of Communication: interpersonal, interpretive, and presentational. Now you need to articulate how Cultures, Connections, Comparisons, and Communities support the Communication goals. How will the students' learning be deepened through these Goal Areas? There are two Standards for each Goal Area which should be addressed within the unit. The Common Core State Standards for English Language Arts (ELA) and Literacy in History/Social Studies, Science, and Technical Subjects provide learning goals that all students need to achieve in order to be prepared for college, career, and life. The ELA Standards include Reading, Writing, Speaking and Listening, and Language. These goal areas align with the three modes of Communication in the World-Readiness Standards for Learning Languages. ACTFL created a crosswalk to show the alignment between the World-Readiness Standards and the Common Core State Standards for English Language Arts. As you plan your unit and how you will assess learning, it is helpful to identify how the performance tasks support the Common Core Anchor Standards. The next step in the flowchart is familiar ground. In order to successfully complete the integrated performance assessment, what "tools" do students need in order to successfully complete the unit? The tools include "can-do statements" and their related grammatical structures or patterns, and vocabulary. Perhaps as you have thought about teaching a unit, you have started by saying "I need to teach past tense now" or "I need to teach clothing now." By designing the assessment first, you can now purposefully select structures and vocabulary that will help the students reach the learning goals you have set for the unit. With all these steps in place, you can now plan your daily lessons. Choose activities and strategies that will help students successfully complete the integrated performance assessment. Your attention is centered on the students: what do they need to do to get ready for the performance assessment. Here is where you incorporate games, pair work, quizzes, homework, skits, class discussions, research, internet activities, videos, reading practice, music. Note that whenever the students are engaged in any of these activities, you are monitoring how successfully they are completing the activity. Students are also self-monitoring what they know and are able to do. Think of the learning activities as formative assessments. Resources include audio, video, print, and visual images that bring the unit to life, making it a real-world learning experience. Although "Resources" are listed near the bottom of the flow chart, you should be looking for potential resources throughout the process. If you find that you cannot locate appropriate resources, you may need to adjust your theme and essential question, or switch to a new theme and essential question. Today's technology-rich environment invites students to access resources from around the world. Students need to gain expertise in accessing and using these resources. They also need to learn how to collaborate with others face-to-face and virtually in order to share ideas and solve problems.